There have been precious few occasions in Pittsburgh to celebrate the artistry of Joni Mitchell, and it hasn't happened with the iconic artist here herself in 42 years. 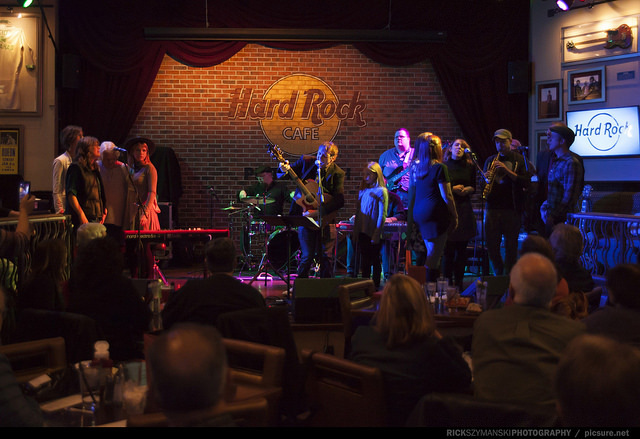 On Friday at the Hard Rock Cafe, Station Square, a group of regional musicians will embrace the challenge of performing her songs at "Miles of Aisles: A 75th Birthday Tribute to Joni Mitchell," benefiting the Myasthenia Gravis Association of Western PA.
"I can't say enough about Joni," says Pittsburgh singer-songwriter Heather Kropf. "Joni is the reason why I thought at 16 years old that I could play my songs in the first place, and her boldness has never stopped inspiring me to be a better writer, better painter, better artist. Her music has everything: intellect, heart and beautiful soul." She will be joined by Angela Autumn, Brewer's Row, Mark Dignam, Carol Lee Espy, Michael Kastelic, Jason Kendall, Rising Regina, Ben Shannon, Brad Yoder and young artist competition winner Sloan Simon. The Pittsburgh concert takes place in advance of a star-studded L.A. affair, "JONI 75: A Birthday Celebration Live," at the Dorothy Chandler Pavilion on Nov. 6-7, with Glen Hansard, Emmylou Harris, Graham Nash, Norah Jones, Chaka Khan, Diana Krall, Kris Kristofferson, Los Lobos, Seal and Rufus Wainwright. It's still not known whether Ms. Mitchell, who suffered an aneurysm in 2015 and makes very few public appearances, will attend the event. The challenge ahead for all of these artists, whether it's Mr. Nash, one of her former flames, or Pittsburgh's Shannon is how to do proper justice to a Joni Mitchell song. "She has this ability to zero in on an emotional state, a character, or a passing thought with a clarity and elegance that I don't hear anywhere else," Mr. Shannon says, and that applies not only to her poetic language but the exquisite phrasing, the unexpected chord patterns and daring vocal leaps. Among some of her contemporaries, she was peerless. "From the moment I first heard her play, I thought she was a genius," Mr. Nash wrote in his book "Wild Tales: A Rock & Roll Life." "I'm good at what I do, but genius? Not by a long shot." "I think in a hundred years they'll look back and say, "Who was the best writer?" and I think it will be Joni," David Crosby, who did a beautiful version of "Amelia" on his last album, told Uncut in 2015. "She's as good a poet as Bob, and she's a waaay better musician." Pittsburgh fans had just three chances to see her here live, and befitting the romance of her songs, two of them took place on Valentine's Day. The first was at the Syria Mosque in 1974, a month after releasing "Court and Spark," one of her best-loved albums and the last of her folk-rock albums in that era before she moved in more of a jazz direction. Pittsburgh Post-Gazette critic Mike Kalina said the show was "a pleasant affair," although maybe too focused on new material. He began his short review going where no man should go: "If Joni Mitchell were as pretty as she sounds she'd be a goddess." The other Valentine's show, in 1976, was her biggest here, played to 11,287 at the Civic Arena, after "The Hissing of Summer Lawns." "An amazing concert," a fan wrote on the tour chronology on her website. "Throughout this concert the fans showered the stage with roses, both because of Valentine's Day and because of 'For the Roses.' Joni told us that she had some new songs she wanted to play that were not out yet, and she played 'Coyote,' which of course would eventually be released as part of the 'Hejira' album later in 1976." Her final performance here was July 10, 1983, at the Stanley Theater (downsized from the Civic Arena due to slower ticket sales). It was two days after Marvin Gaye played the same room, and she added "I Heard it Through the Grapevine" to her set. The Pittsburgh Press review informed us that "she's really not an entertainer" - in case people were looking for a song and dance. She had a grand piano on stage and did classic songs as well as new ones from "Wild Things Run Fast," a return to pop form. One fan wrote on her site, "If I ever come across a time machine, this will be my first stop back." She was off the road for a long stretch after that and did her final touring in 1998 and 2000, after which she's recorded three albums, exhibiting a smokier tone to her voice. Since then, she's been out of sight though not out of mind to fans and young singer-songwriters inspired by her work. "Joni always says that if you see her when you listen to her music, you are missing the point," notes young Pittsburgh musician Angela Autumn. "However, after conducting extensive research into her life and listening to her albums until they were worn thin, I cannot help but visualize a young, vulnerable Mitchell crafting songs from a closet. Her honesty is an inspiration to young writers everywhere." "People ask me, 'What's the connection between Joni Mitchell and Myasthenia Gravis?'" says benefit organizer Maree Gallagher, "and I say, 'Me! I'm the connection!' I'm a huge fan, and I'm executive director of the Myasthenia Gravis Association. Plus, I happen to know a lot of talented, generous musicians. I always say Joni's music helped me get through high school, and her shine has never worn off. Her lyrics set the bar and left me with very high standards for songwriting. There will never be another Joni." • Michael Kastelic (frontman for The Cynics): "I'm looking forward to this show. I am happy to be a part of something that reminds people what a genius Joni is." • Jason Kendall: "Lyrically, the perspectives of Joni's poetry grow and change with the listener as time passes. The same can be said of her music. You find something new and subtle each time you listen. To me her music has a strong jazz influence. It sounds spontaneous but it's carefully crafted." • Ben Shannon: "Joni Mitchell's music contributed to expanding my understanding of what singer-songwriters were capable of in terms of melody and lyric. At first I was alternately attracted and distracted by her melodic approach to songs. Then I learned to move my feet a bit - as if studying an impressionistic painting - and was able to hear her music in a new way that lifted and carried her lyrics to the surface. Her songwriting is stunning. ... She's more of a poet than Dylan ever was. She's closer to Cohen." • Brad Yoder: "Joni Mitchell is the gold standard for writing songs which are deeply personal, poetic, and unashamedly artful. She finds ways to be relatable and catchy, while simultaneously creating high art which is utterly surprising and deeply moving. No one ever accused Joni of not aiming high enough!" • Carol Lee Espy: "So much is said about Joni Mitchell being a stand-out female songwriter, but I never separated her from the pack in a male versus female way. She stood out uniquely on her own, with her stunning voice and intelligent lyrical imagery. I love her songs because they make me feel good performing them, always the hallmark of an excellent song. Her music constantly evolved through folk, jazz, pop and through the times from the late '60s to today, it's been a personal life soundtrack for me. Thanks, Joni, Happy Birthday!" • Leah Hohman Esser (Brewer's Row): "Joni Mitchell's 'Court and Spark' was one of a handful of records to find a spot on the soundtrack to my childhood. My parents were fans and my father a musician himself. With that, it came to represent a certain comfort. Her music still evokes images of our home in Valencia. Today, I can say the appeal is in Joni's smart yet simple lyrics - observations on changing perspectives like those of a child versus those of that child now an adult. 'Something's lost but something's gained in living every day.' I've listened to her music 'from both sides now' - as a child and as an adult - and I have been drawn to it both ways." This article has been viewed 591 times since being added on November 12, 2018.